Cherry is one of those all-around woods that is great for furniture, cabinetry, millwork, turning, or any other project big or small. Cherry is easier to work, stable, and finishes easily. Cherry develops a rich reddish-brown patina as it ages. This aging process can be accelerated by exposing the wood to direct sunlight. We stock Cherry in a few different grades explained below. Common Cherry - Lower grade of Cherry allows for more sap wood, narrower pieces / shorter lengths on average. SAB Red Cherry - Select and Better Red grade has at least 90% heart one 1 face of the board. Basically means less sap wood on 1 face. Lengths and widths are similar to the SAB grade. 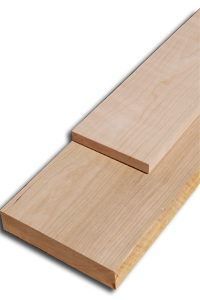 ​Quartered Cherry - is cut so the grain is straight and runs the length of the board. You still get the Cherry color, but the grain is different. Quatersawn cut tends to be more stable.